LAHORE: A senior journalist on Tuesday shared a video on twitter of ex-prime minister Nawaz Sharif bidding farewell to his comatose wife before heading to Pakistan to serve his imprisonment sentence in the Avenfield corruption reference. In the video shared by journalist Talat Hussain, Nawaz is seen calling out to Begum Kulsoom, asking her to open her eyes. “Zara ankhain kholo Kulsoom, bao jee! (Open your eyes Kulsoom, it’s bao jee)” he says. “Allah aapko sehat de (May Allah grant you health),” he adds. The emotional video was probably filmed before the former premier’s departure to Pakistan. Former first lady of Pakistan, Begum Kulsoom Nawaz passed away at the age of 68 in London on Tuesday after her health began deteriorating on Monday night. The news was confirmed by her son Hussain Nawaz and her brother-in-law Shehbaz Sharif, who will be travelling to London to receive Kulsoom’s body and bring it to Pakistan for burial. She is survived by her husband and four children, Hassan, Hussain, Maryam and Asma. 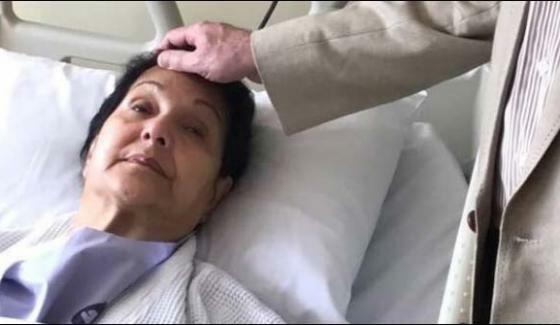 Moreover, Harley Street Clinic said that Kulsoom’s body will be shifted to a mortuary.